Booklet number 7 in Daniel Goleman et al’s “Building Blocks of Emotional Intelligence” is entitled ‘Organizational Awareness”. I have found it helpful to summarise the key points from the various contributors in the book. Why is organisational awareness so important? Informal and social networks (within and outside the organisation). Knowing who are the opinion leaders, decision makers, influencers. Who are the people that people defer to? Who are the people who make things happen (or block them from happening)? What is the nature of the interactions with external partners, suppliers, customers? The engagement of every employee: the demonstrated connectedness between the organisation’s mission, values, goals and day-to-day behavioural norms. How people are focusing their attention and their energy. External forces affecting the organisation e.g. through PESTLE analyses (Politics, Economics, Social, Technical, Legal, Environmental) to understand the external landscape and how this might affect the organisation; how it should be adapted. Extension of personal emotional intelligence to the wider organisation: applying all the skills we have for understanding and controlling our own emotions to the wider context in which we operate. Using these skills to understand the emotional undercurrents in the organisation and, in a leadership situation, to influence and channel them towards a positive outcome. Ask yourself and others about what is going on when decisions are being made and change is taking place. Find out who are the ‘go to’ people: the ‘movers and shakers”. Carry out analytical research, or commission external consultants to help you with this. Now… how will you approach organisational awareness? For my part, these are again extremely useful insights to weave into RiverRhee’s courses for managers and teams. About the author. Elisabeth Goodman is the Owner and Principal Consultant at RiverRhee Consulting., a consultancy that specialises in “creating exceptional managers and teams”, with a focus on the Life Sciences. (We support our clients through courses, workshops and personal one-to-one coaching.) Elisabeth founded RiverRhee Consulting in 2009, and prior to that had 25+ years’ experience in the Pharmaceutical Industry in line management and internal training and consultancy roles supporting Information Management and other business teams on a global basis. RiverRhee is a support supplier for One Nucleus and a CPD provider for CILIP (Chartered Institute for Library and Information Professionals). Elisabeth is accredited in Change Management, in Lean Sigma, in Belbin Team Roles, MBTI (Myers Briggs Type Indicator) and is an NLP (NeuroLinguistic Programming) Practitioner. She is a member of CILIP and of APM (Association for Project Management) in which she was a founding member of the Enabling Change SIG. I’ve written a few blogs on the characteristics of high performance teams and how to evaluate them and summarised them in this one on my RiverRhee website (http://riverrhee.com/blog/temperature-checks-or-diagnostics-high-performance-teams). Daniel Goleman et al’s “Teamwork: a primer”, number 11, in his “Building blocks of emotional intelligence” series, provides some additional helpful insights. The first premise, which I absolutely endorse, is that “everyone who is part of a group can positively influence the team’s effectiveness through how they handle their participation in the group”. In fact I would say that it is every team member’s responsibility to positively influence the team’s effectiveness. As Goleman says, if other team members, or indeed the team leader, are not also doing this, then just one person’s positive behaviour may influence the others’. The various co-authors of the primer stress how important it is for everyone on the team to have emotional intelligence. And, that this is as important as technical and cognitive ability for the success of a team. The team leader has a key role to play to set the tone for the team. What they say and do will act as an example or role model, and absolutely influence what happens. As Matthew Lippicott says, it is down to the leader to “clearly communicate, develop trust and provide performance-oriented feedback”. As Vanessa Druskat says, a leader’s skill in setting the right tone is a feature of how well they balance their cognitive and emotional intelligence competencies. There is lots more that a leader can do, as described in the next section. Vanessa Druskat describes team norms as “the habits, expectations and behaviours” of a team). The following illustration is my summary of the five norms that I’ve picked out from “Teamwork: a primer”. The illustration shows how the leader can influence and support the team’s behaviour, as well as the part that each team member can play. The authors of the primer have done a great job at identifying all of these aspects. Their conclusions comes from studies of teamwork amongst MBA students, sports teams, a global engineering and construction firm, and other studies and findings in the literature. Interpersonal understanding and caring (as described by Vanessa Druskat and Daniel Goleman) happens when the team members take time to understand each others’ strengths, weaknesses and attitudes. The leader sets the tone by demonstrating empathy and interest in each individual as opposed to being solely focused on the team’s efficiency. People are alert to their colleagues feeling upset, left out, overwhelmed and take supportive action. Diversity and inclusivity is described by Richard Boyatzis and Ann Flanagan Petry. Team members help each other to participate fully for example by creating verbal space for others to express their views. Individuals feel welcome and acknowledged by their colleagues. Effective accountabilities (also described by Vanessa Druskat and Matthew Lippicott) relies on the leader being able to clearly communicate their expectations, and everyone taking a proactive role to fulfill their accountabilities. This norm will be enhanced by people being acknowledged and appreciated for their hard work. Team self-evaluation (described by Vanessa Druskat) requires a leader to be open to suggestions for improvement (demonstrating vulnerability vs control). Team members also need to have the opportunity and take the time to reflect on the team’s performance and how it could be improved. Altogether, these ‘norms’ go across many of the 14 good team working practices that I’ve described elsewhere. They form an excellent basis for evaluating and improving a team’s performance, and I will be adding them to the mix in RiverRhee’s work on building and developing teams! 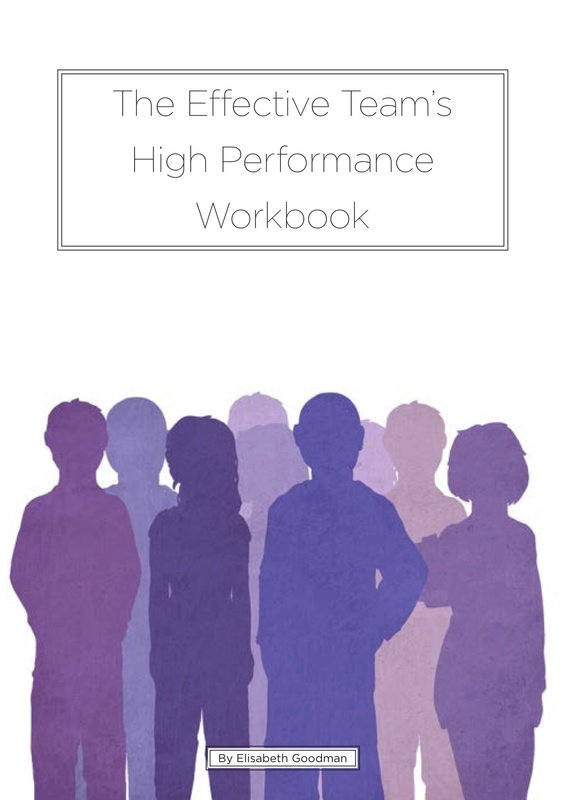 The Effective Team’s High Performance Workbook – out soon! I’m delighted to say that the second in my series of “The Effective Team’s ” workbooks will be coming out soon. “Being part of a team that has achieved a level of high performance can be a truly enriching experience. In this second book for ‘effective teams’ the author draws again on her experience with business support groups such as Library and Information services, and with organisations in the Life Sciences and SMEs (Small and Medium Enterprises). The book reflects her approach as a line manager, project manager, trainer and coach for achieving high performance teams. The first two chapters focus on the stages of team development and how to understand and value the differences between individuals within your team. Chapters 3 to 6 take you through the processes to use if you are looking to actively enhance your team’s effectiveness to help it reach and sustain high performance. There are practical scenarios to show how the various principles and methodologies can be applied, and each chapter has an exercise for practising the principles and methodologies, either in teams or individually. The workbook also includes support materials in the form of full-page versions of illustrations, tables and a questionnaire for use as a team and for your individual planning. There are references for further reading if you would like to find out more about the subject. Copies are priced at £10.00 each, plus packaging and posting, and will be available via the RiverRhee Publishing web page. Or you can use the RiverRhee contact form to pre-order your copy. The workbook on change management was published in November 2013 and can be ordered through the RiverRhee Publishing web page. Future books in “The Effective Team’s” workbook series will address operational excellence, knowledge management, and facilitation. Elisabeth has 25+ years’ experience in the Pharmaceutical Industry where she has held line management and internal training and consultancy roles supporting Information Management and other business teams on a global basis. Elisabeth is accredited in Change Management, in MBTI (Myers Briggs Type Indicator) and in Lean Sigma and is a member of CILIP (Chartered Institute for Library and Information Professionals), APM (Association for Project Management) and is also registered as a Growth Coach and Leadership & Management trainer with the GrowthAccelerator. A more effective approach to feedback?